The Warehouse is a room inside of the Old Clockworks in Luigi's Mansion: Dark Moon. The Warehouse is accessed by taking the north door in the Clockworks Court. This is a two-floor room with many colors of ribbons strewn about. An odd machine that is used for unraveling these ribbons is located near the entrance. Several crates, gears, and spools of ribbon are found in this room as well. A large safe is found in this room and nearby are three large metal 3s. Some spiders have made their homes in this room. To access the second floor in this room, Luigi can simply use the lift on the left side. On the first floor, the door to the south leads back to the Clockworks Court. On the same floor, the door to the north leads to the Roundhouse and the door to the right leads to the Workshop. On the second floor, the door to the north leads to the Clockmaker's Chambers, but the door to the right leads to the Drafting Office. During A Timely Entrance, Luigi needs to go to the Warehouse after seeing a Greenie trying to use the machine. Luigi can unravel these red and green ribbons for various objects to appear, from bills to spiders. However, Luigi needs to open the safe by shining the Strobulb on it. This reveals a yellow ribbon that can be unraveled for a key. In this same mission, there is a ball of red ribbon shaking by the lift. Unraveling this ribbon reveals this mission's Boo. Before Luigi obtains the Special Compass in the Drafting Office, he can go through the door to reach the second floor of the Warehouse where many Gold Bars and a treasure chest filled with money are located. In Roundhouse Brawl, Luigi is automatically pixelated into the Warehouse. The way to the Workshop is blocked off by a large spiderweb that cannot be burned down and a crate has opened to reveal a Robomb inside. The debris on the second floor can be destroyed by activating the bomb near it. When Luigi gets to the second floor, there is a treasure chest that runs away from him. If Luigi chases the treasure chest to a dead end and inspects it, a Gold Greenie pops out. The yellow ribbon in this mission has a gold bar and the two green ribbons in this area give out twenty bills while the other gives out ninety-five gold. In Play Catch, the Warehouse is the first room the Polterpup goes through. When Luigi enters the room, he has to fight a Greenie with a paranormal shield. The safe contains a green ribbon ball that yields three bills hidden by Spirit Balls. During Outlandish Interruption, the Warehouse might be one of the room infested with ghosts. 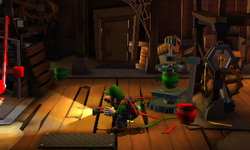 In most missions, Luigi can use the Dark-Light Device to find a ball of ribbon. Unwrapping this object using the machine releases a ruby.